But I think, that maybe, just maybe, the Royals will be decent this year. I can't guarantee it and I'm sure disappointment will ensue, but I want to be involved until then. Ya know ? And let me just say I've always hated bands, blogs, or whatever that quit and then come back. So if for that reason you choose not to read this post or anything I write on here ever again, that's awesome ! Stand up for what you believe in. Anyway it's more like a perfect storm that's getting the blog up and running again, more then anything. See today is the season finale of The Walking Dead and tomorrow is Opening Day ! The perfect chance for a dead Royals blog to rise up and haunt the world wide web once more. If your not familiar with The Walking Dead, it's about Sheriff Deputy Rick Grimes and a group of people trying to live what little bit of life they have left before they eventually die and turn into zombies (or just die). It's sad at times and overall far from cheery. (Much like the Royals 1986 - present). I don't really know where I'm going with this it sounded way better in my head. So stock up on the sunflower seeds, and scorecards. Sharpen the pencils and dust off those radios (Or else you could listen to Rex Hudler your choice, but no really dust off that radio) because tonight when the zombies are gone away and Mr.Grimes' crew goes the way of Emil Brown, Terrance Long, and Ross Gload. Well then it's baseball time. 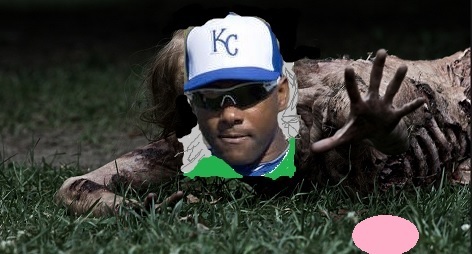 So good luck to our beloved Royals and a special shout out to a fellow zombie trying to come back from the baseball grave Miguel Tejeda. Fellow zombie Miguel Tejeda reaches for an Easter egg before I can get to it. The 2013 season is here and with "some" luck it'll finally be our year !